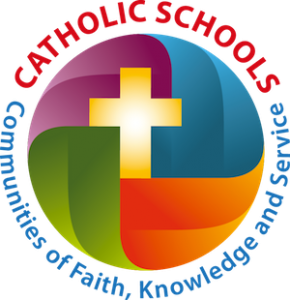 Both the library and technology lab at the School of Sacred Heart St. Francis de Sales are inviting areas for both students and staff alike. Other teachers make use of the space for integrating technology into the classroom. 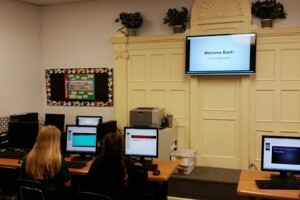 The computer lab has 20 state of the art computers with a smart TV to enhance learning. Middle School Students use Google Docs to create document, spreadsheets and presentations to share with their teachers. The shelves of the library are overflowing with books for readers from Kindergarten age up through the eighth grade, as well as adults. Students lose themselves in a diverse choice of books including award winning Red Clover books and Dorothy Canfield Fisher award books. Using the Dewey Decimal System, the library shelves are filled with fabulous fiction, nonfiction and plenty of research titles. Students borrow books on a weekly basis. Reference books and magazines abound and enhance the computer lab and its reach into the World Wide Web.